Morning LIMettes, it's time for the final challenge of February and this week it's a Sketch over at Less Is More. Here is the sketch! I used one of the up and coming trio images from LOTV which are released on the 28th! This is from the moving day trio in digi so it can be re-sized! A simple chevron die for the strip and it's done! Morning LIMettes, It's time for a new challenge over at Less Is More and I went for something a little different on this weeks Alphabet theme challenge. 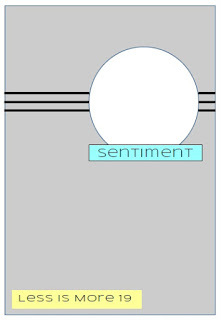 Sometimes I feel like all my cards just look the same so I am venturing out of my comfort zone and trying new things. Here I got a little inky for this chalk board look with a fab back ground stamp and made it feminine with the felt flowers. Good Morning.... I'm such a bad blogger at the moment, just not had time to edit and write up posts this last couple of weeks.. just wish it was easier from my iPad whilst i'm out and about. 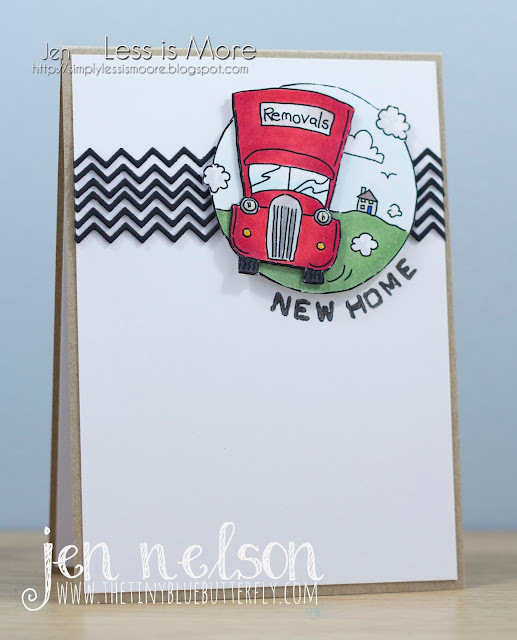 Anyhow, I have a card I made for Craft Stash before Christmas that I just didn't get around to blogging. 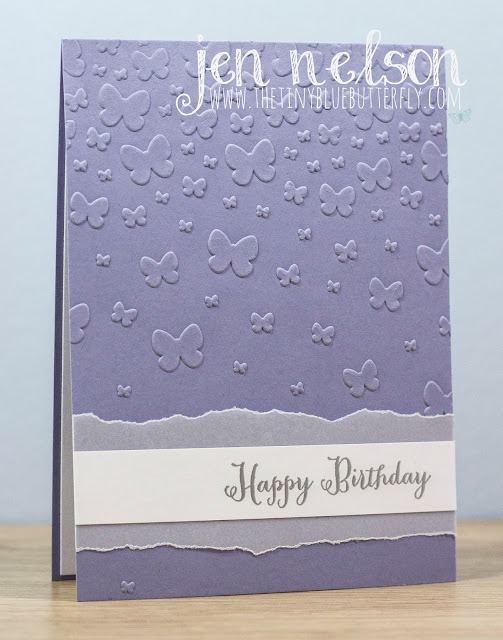 This one is using one of the cascading embossing folders. I had to do some surgery on the embossing folder to allow it to come up the card base. This is a great technique for making more out of your embossing folders. Morning.. sorry not been posting much, I have starting crafting a bit more and a load of cards to edit etc but just not had much time to do that. 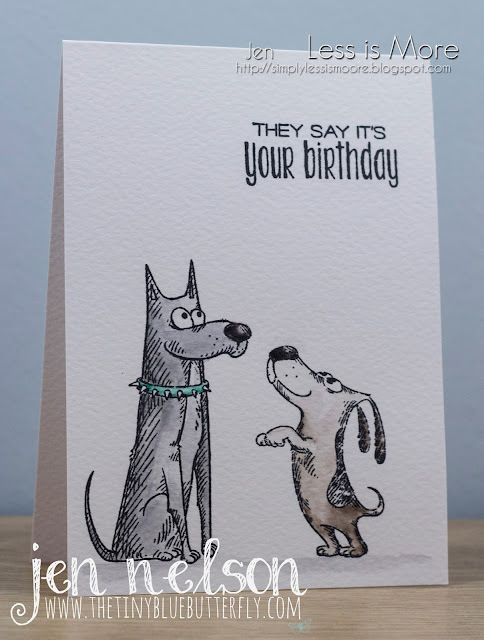 Today I have a card I made for Lizy for her Birthday earlier this week, Lizy is also a Qualified PT so I thought this stamp was perfect! Afternoon.. I have the pleasure of guest designing over at one of my favourite challenges this week.. CAS(e) This Sketch. 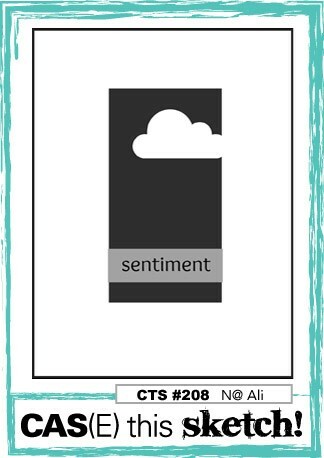 We are on Sketch #208 and what a fab sketch it is!!! 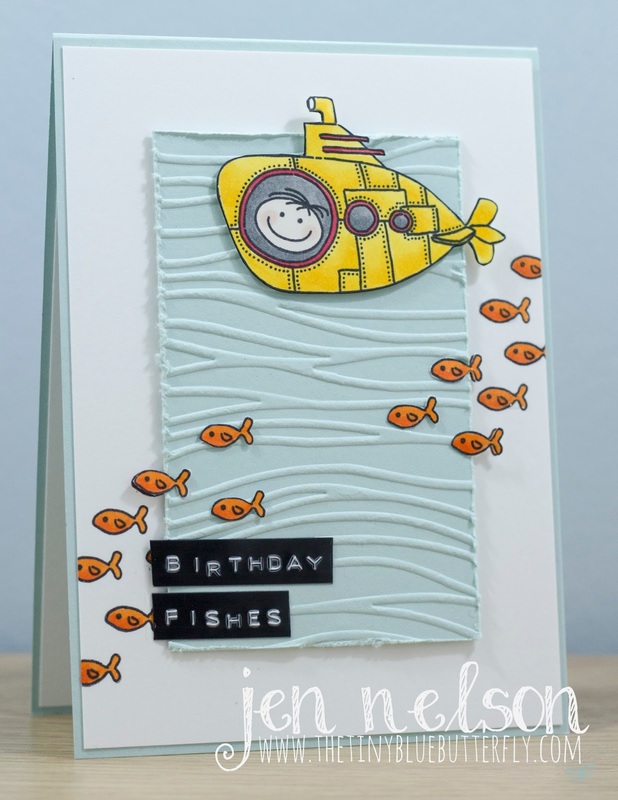 A few fishes thrown into the mix and some embossed waves and it is complete! Make sure you check out the rest of the design team this week.. they are all amazing! Morning LIMettes.. Can you believe that Less Is More has been going for 6 years.... It was the first challenge I ever took part in and has been such a big part of my crafting life for all this time. From getting up at the crack of dawn to see how fast I could create... I'm sure me and Lizy were competing at one point, to joining Chrissie on the design team, leaving the team due to work commitments and finally coming back when Chrissie left at the end of last year. It really has been a fabulous adventure in crafting, and although I do not gte to craft or blog as much anymore I love being part of this family. We have a bumper month for you with a sponsor a week, a new look and of course this weeks challenge. Firstly onto the challenge. 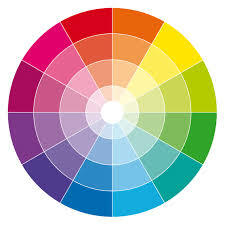 This week is Colour week and we would like to see 3 adjacent hues from the colour wheel. 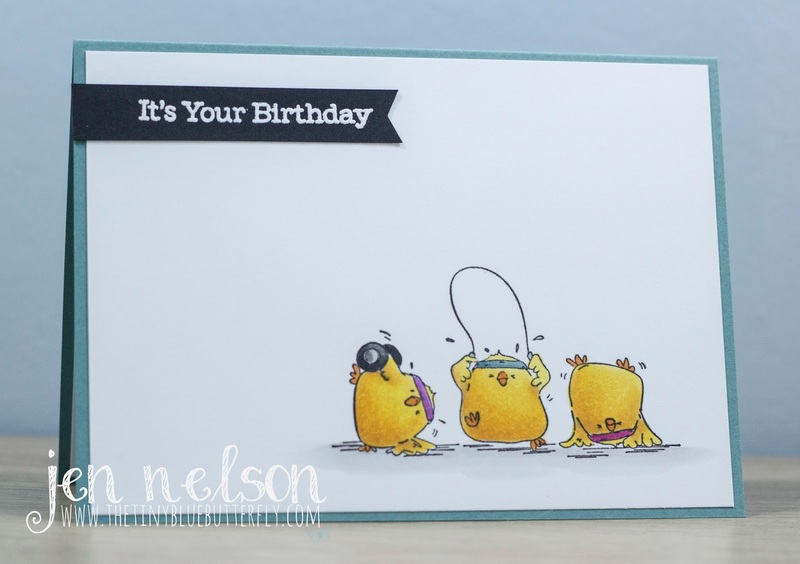 I must say I had so much fun making this card! 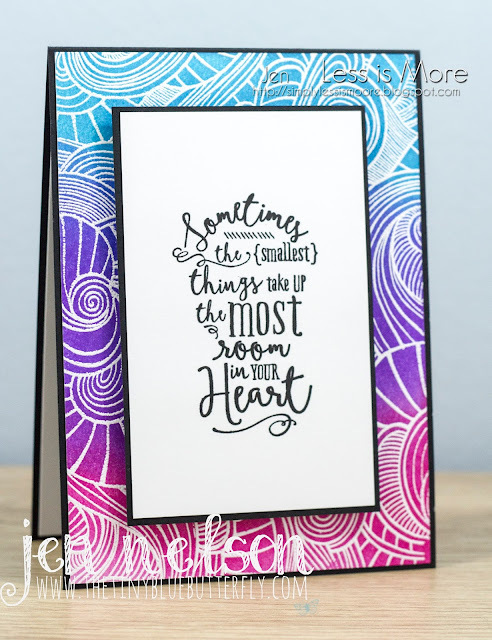 I found I was making cards that were simply all the same, so I am trying to venture out of my rutt and find my mojo again by trying new techniques and having some fun. 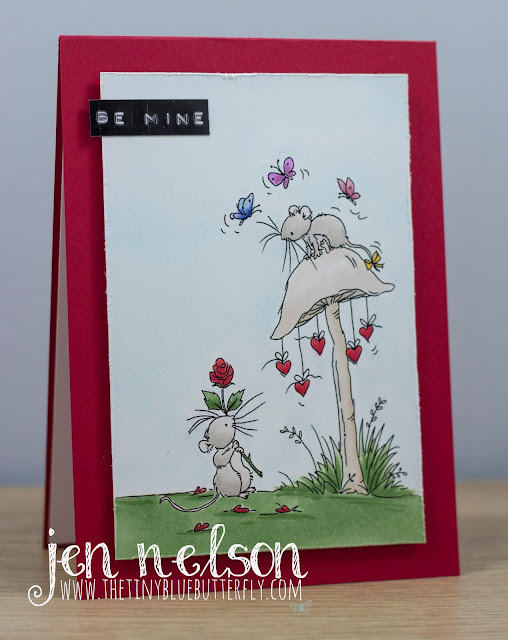 The background stamp from My Favourite things was heat embossed with white and then using distress inks I blended in the background. Finally, Less Is More has updated it look to celebrate! Make sure you check it out! I will have an update stash sale now I have finally sorted it all out! The link is below if you want to see what is already there but I have loads of photos to add this weekend! Have a fabulous Saturday, I'm off to event city for the craft show in Manchester then chilling out in the craft room after a long week away with work!